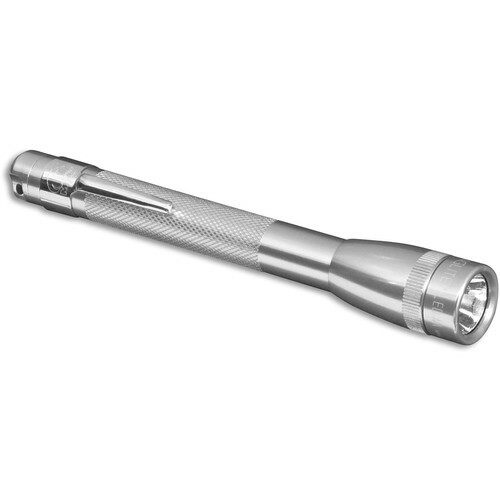 Heir to the Maglite compact 2-cell AAA incandescent flashlight launched in the 1990s, the Mini Maglite 2-Cell AAA LED Flashlight employs modern LED technology for a bright, 100-lumen beam with the same compact, durable, easy-to-use form factor. Presented here in silver, the light comes in a beautiful presentation box with a pocket clip and two batteries. Simply twist the light head to turn it on and off and to adjust the beam from spot to flood. Constructed out of an anodized aluminum alloy and IPX7-rated for water resistance, the Mini Maglite can withstand being submerged in 3.3' of water with no damage and is impact resistant to a height of 6.6'. Its runtime on two fresh batteries is nearly four hours.